Tomorrow's the big day! I'll be presenting at the NLUUG VJ-2010 convention, introducing the attendants to BoKS. I was told to expect a maximum of 80 people in my room, which is kind of reassuring. 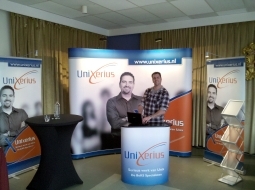 Yesterday my colleague Kees and a friend of his built the Unixerius booth which looks smashing, although I personally think it's a bit overkill. I mean, we're bound to get a question like "Say, what's the name of your company again?" Say, what's the name of your company again? The booth did indeed look good. Really? Don't think it was over the top? A bit too "corporate"?